Stress-strain diagram for uniaxial loading of ductile and brittle materials. Home » Material Science » Stress-strain diagram for uniaxial loading of ductile and brittle materials. Standard specimen are used for the tension test. lg = gauge length i.e. length of the specimen on which we want to determine the mechanical properties.The uniaxial tension test is carried out on tensile testing machine and the following steps are performed to conduct this test. How Tensile Test Is Carried Out On Universal Testing Machine? (i) The ends of the specimen are secured in the grips of the testing machine. (ii) There is a unit for applying a load to the specimen with a hydraulic or mechanical drive. (iii) There must be some recording device by which you should be able to measure the final output in the form of Load or stress. So the testing machines are often equipped with the pendulum type lever, pressure gauge and hydraulic capsule and the stress Vs strain diagram is plotted which has the following shape. (A) So it is evident form the graph that the strain is proportional to strain or elongation is proportional to the load giving a st.line relationship. This law of proportionality is valid upto a point A. or we can say that point A is some ultimate point when the linear nature of the graph ceases or there is a deviation from the linear nature. This point is known as the limit of proportionality or the proportionality limit. (B) For a short period beyond the point A, the material may still be elastic in the sense that the deformations are completely recovered when the load is removed. 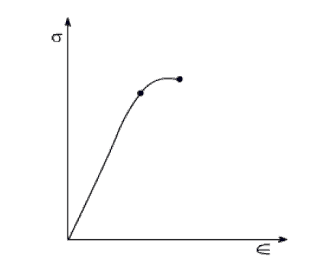 The limiting point B is termed as Elastic Limit . (C) and (D) – Beyond the elastic limit plastic deformation occurs and strains are not totally recoverable. There will be thus permanent deformation or permanent set when load is removed. These two points are termed as upper and lower yield points respectively. The stress at the yield point is called the yield strength. (E) A further increase in the load will cause marked deformation in the whole volume of the metal. The maximum load which the specimen can with stand without failure is called the load at the ultimate strength. The highest point ‘E’ of the diagram corresponds to the ultimate strength of a material. Su = Stress which the specimen can with stand without failure & is known as Ultimate Strength or Tensile Strength. Su is equal to load at E divided by the original cross-sectional area of the bar. (F) Beyond point E, the bar begins to forms neck. The load falling from the maximum until fracture occurs at F. Beyond point E, the cross-sectional area of the specimen begins to reduce rapidly over a relatively small length of bar and the bar is said to form a neck. This necking takes place whilst the load reduces, and fracture of the bar finally occurs at point F.
The ductility of a material in tension can be characterized by its elongation and by the reduction in area at the cross section where fracture occurs. It is the ratio of the extension in length of the specimen after fracture to its initial gauge length, expressed in percentage. For 50 mm gage length, steel may here a % elongation d of the order of 10% to 40%. It we just examine the earlier tension curve one can notice that the extension of the materials over the plastic range is considerably in excess of that associated with elastic loading. The Capacity of materials to allow these large deformations or large extensions without failure is termed as ductility. The materials with high ductility are termed as ductile materials. A brittle material is one which exhibits a relatively small extensions or deformations to fracture, so that the partially plastic region of the tensile test graph is much reduced. This type of graph is shown by the cast iron or steels with high carbon contents or concrete.